Price: £28.50 (incl VAT) Sorry, this item is currently unavailable. Click here to receive notification when this product comes back into stock. 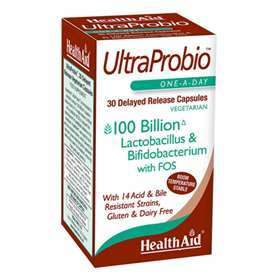 UltraProbio capsules also contain a probiotic (FOS) which stimulates the proliferation and survival of 'friendly bacteria' to help restore a healthy bacterial balance in the gut to aid digestive complaints such as bloating, flatulence, diarrhoea and constipation. UltraProbio also boosts the immune system and aids the absorption of nutrients from the diet. Free from Yeast, Gluten, Wheat, Soya, Dairy, Sugar, Artificial Colours, Preservatives & Flavourings. Helps restore a healthy bacterial balance in the gut. Helps prevent the overgrowth of harmful yeasts and bacteria. Take one Health Aid Ultraprobio capsule daily on an empty stomach, preferably in the morning. Do not exceed recommended daily intake unless advised by a suitably qualified person. The stated bacterial count is the amount present up until the end of shelf life; provided recommended storage conditions are strictly adhered to. Due to the unstable nature of the organisms, the live bacterial count may vary or decline over time depending on temperature fluctuations and storage conditions. Product code: 3952843 Price: £28.50 (incl VAT) Sorry, this item is currently unavailable. Click here to receive notification when this product comes back into stock.